I have cold don't feel good to do household chores It makes me sick and bother my nose as well as I have little headache this day I admit I don't like to be sick but Zzzquil does not contain the same medication that is found in regular label most drugstores carry a generic or store brand with the same amount of active ingredients as the other brands. which really does help for me to sleep good. When I purchased this product it was just a liquid form of benadryl formulation can make a difference and I had a $2 coupon I can save I have coupon on it. I figure it out It's worth good I took the recommended dose at bedtime, and a couple hours later, felt absolutely good. If diphenhydramine makes me drowsy, this product work for me but it's much cheaper to buy at the pharmacy since it's only 7 minutes to drive where I lived. 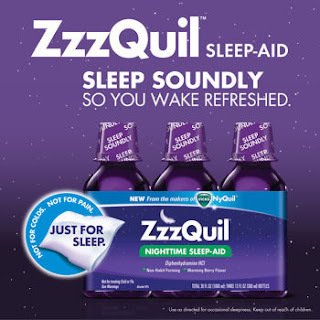 I was excited when I saw Zzzquil making a good night sleep because this product really does help to sleep when I take it for colds, . a couple of hours to sleep. I am so glad that I bought it. I take 20 ml and within 45 minutes, I am asleep. I wake up feeling great and with a non drowsy feeling nor don't have bad dreams that some others have experienced. The taste is actually good. I thought it would taste like bad I was wrong it was good though This was surprisingly good for me. Since I first bought it from other store is not good at all so I bought 1 other bottle in different store as it is bit expensive but it was good.. It is well worth the price. I think I need this today....waahh.